CD review: "In All Languages"
This review first appeared in the October-November issue of A Critique of America. I forget who originally wrote it, but the quote caught it all. It went to the effect that until Ornette Coleman came along, jazz had been sailing the ocean, with each new innovator showing us another sea, a new inlet we hadn't known of before. Then Ornette came along and showed us we could dive beneath the surface and explore a whole other world. And that's it right there. Ornette's music takes the eddies and currents of thought and feeling that are usually kept below the surface and brings them out into the open where they can be fully explored. 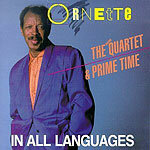 Ornette's latest release, "In All Languages," is a two-disc set of a different sort. The first disc finds Ornette performing with his original quartet of Don Cherry on trumpet, Charlie Haden on bass and Billy Higgins on drums. While these four played together regularly in the 1950s and '60s, they haven't been together as a unit for years. The second disc is Ornette with his current band, Prime Time, consisting of his son Denardo and Calvin Weston on drums, guitarists Charlie Ellerbe and Bern Nix, and bassists Jamaaladeen Tacuma and Al MacDowell. Adding to the contrast between his acoustic lineup and the new electric combo is that many of the same compositions are performed by both groups  showing how Ornette's own playing is influenced by having different ensembles around him. "Feet Music" as performed by the Quartet is polished and mature when compared to Prime Time's version, which is full of the spirit and energy of youth. With Prime Time, Ornette pushes his sax ever faster through the theme, using the passage as his basic building block. With the Quartet, he concentrates more on each note, looking for exactly the right tone to capture the essence of what he's feeling. And that tone is highly personalized, as much so as Sonny Rollins or John Coltrane, although most analyses of Ornette overlooks this aspect of his art. Too many listeners are caught up in Ornette's highly individualized approach to structure to truly explore his virtuosity on saxophone. Ornette may always be known for his groundbreaking work as a young man. But it is now, in his maturity, that his playing is at its best.